Duke's of Dorchester has a strong track record in acquiring excellent Chinese antiques, with the most famous example being the vase bearing the mark of Emperor Qianlong which had been used as an umbrella stand until the couple who owned it sold it through the auctioneer for £625,000 a little over a year ago. So few collectors interested in the area will be ignoring their Important Chinese Art Including 'Treasures from the Summer Palace' which is coming up later this month. 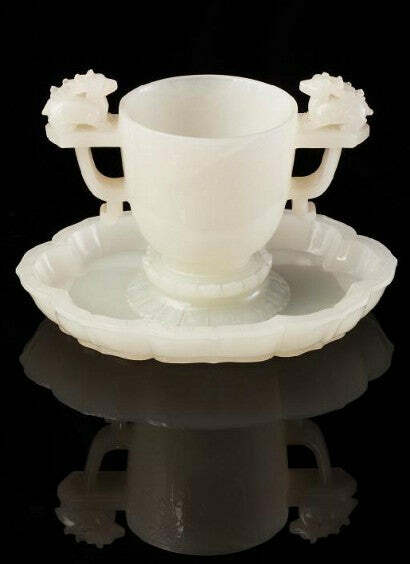 One of the key lots is an exceptional Chinese white jade cup and saucer. The cup has scroll handles surmounted by recumbent stags and the body finely carved with a band of pendant tassels around the rim. The saucer is in the form of a lotus with a raised central section carved with a shou emblem and the rim with a key pattern border. The stone is of pure and even tone and with a lustrous polish, and is from the era of Qianlong. It originated from The Summer Palace, with Captain James Gunter of the Kings Dragoon Guards first removing it from the country when he was in command of G Troop in China in 1860. This exquisite cup and saucer may be compared to a similar example in the Qing Court Collection illustrated as plate 106 in The Complete Collection of Treasures at The Palace Museum Jadeware (III) published in Hong Kong in 1995. The stag symbolises longevity and is said to be the only animal capable of finding the sacred Fungus of Immortality. In Chinese art the deer is depicted with court officials and it is said that this signifies a wish for fame, recognition and a long successful career. Gunter's descendents own the piece as part of a collection which the auctioneers believe may be worth as much as £1m ($1.65m). The cup and saucer alone at listed at £100,000-200,000 ($330,000) and should make an excellent investment. Duke's auction will take place on May 19. Watch this space for more news on this exciting sale.